GALLUP, N.M. — On May 4, three scholarships in the name of Korean War Medal of Honor recipient Hiroshi “Hershey” Miyamura were given as part of the seventh annual Senior Recognition Night at Hiroshi Miyamura High School in Gallup, N.M. 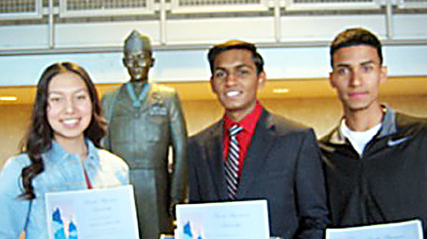 The scholarship recipients were: Luis Saul Martinez, who will attend the Universal Technical Institute in Phoenix to become an automotive technician; Tiana Miller, who will study animal science at New Mexico State with plans on being a veterinarian; and Nilay H. Patel, who will major in mechanical engineering at the University of New Mexico for a future career in automotive design. Miyamura High School offers students an opportunity to take vocational skills classes at the University of New Mexico as part of their high school education in addition to college preparatory courses. These technical classes provide 70 percent of the skills to get into a career and include carpentry, plumbing, welding, baking, restaurant services, medical terminology, telecommunications and broadcast news media. Miyamura first served with the 442nd Regimental Combat Team at the end of World War II. When the Korean War began on June 25, 1950, he was recalled into active duty with the Army and was sent to Korea as a machine gun squad leader in Company H, 7th Regiment of the 3rd Infantry Division. At Taejon-Ni, when being overrun by the Chinese Communist forces, Miyamura ordered his men to retreat while he held off the enemy with a machine gun, bayonet and his own hands. Records and eyewitnesses account for more than 50 of the enemy being killed before Miyamura was wounded and captured. Contributions to the Hershey Miyamura Scholarship Fund can be sent to Hiroshi Miyamura Scholarship, c/o Miyamura High School, 680 S. Boardman Ave., Gallup, NM 87301.